And, considering your average adult cat’s lifestyle - sleep, groom, eat, nap, repeat - it’s no wonder they have weight issues. Besides, your cat also needs regular exercise for mental stimulation. Otherwise, your kitty will be bored and frustrated. So, what’s a caring cat owner to do? Forget signing your cat up for barre class! Here are some simple at home ways you can increase your cat’s movement and mental ability to keep them in healthy shape. There are some simple ways you can help your cat stay active, no matter their age. The Classic Laser Pointer -- These moving red lights offer hours of entertainment for both you and your cat. As you bounce the light off the floor, wall, or ceiling, your cat will chase and pounce at the light. Just be aware of your cat’s abilities, and keep the laser lower for older cats. Also, don’t let it shine in your kitty’s eyes as that can be painful. Create Space to Climb -- Climbing is good for balance and helping your cat maintain his agility. Whether you get a 3 or 4 tier kitty tower or keep space available on a shelf, it’s a cat’s natural inclination to climb and explore. If, for some reason, your cat doesn’t show interest, try putting small treats at different intervals to encourage exploration. 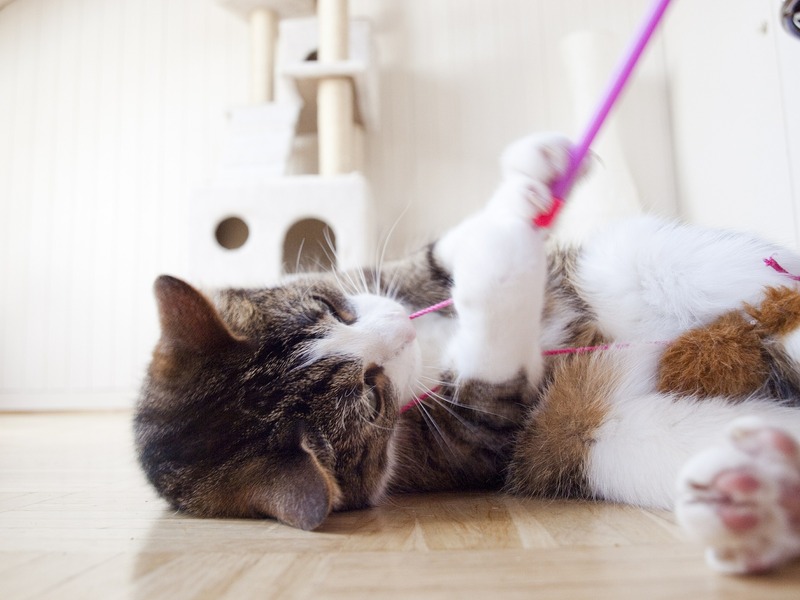 Get a New Toy -- From those wands with dangling feathers to catnip stuffed mice, there are tons of toy options for cats. However, some cats will show more interest if you interact with them. So, dangle the feathers over their face, or play hide and seek with the stuffed mouse. Give it a try; you may be surprised by how much your kitty enjoys it. By the way, that catnip “high” that flips the “zoom” switch on some cats? That’s genetic and only affects about 50% of cats, so don’t worry if yours isn’t one of them. Try a Playmate - This works best for younger cats. If you have a senior cat, it’s usually not a good idea to adopt a kitten as a playmate as the kitten's antics will usually annoy your older cat. Better if you can get them together when they’re young. If you do, they’ll behave just like human siblings in that they’ll entertain one another throughout their lives. Take a Walk -- Believe it or not, you can train your cat to walk on a leash. You’ll just need one of those cat-sized leash and harness combos available at pet stores. Well, that and the patience to work with your cat and get them accustomed to it. But once you do, they can go outside with you and explore a city sidewalk. Just don’t take them for a walk with your dog; chances are, they’ll never walk at the same pace. And be sure to contact us first to ensure that your cat has the tests, vaccines, and preventives meant to protect them during outdoor adventures. Regular exercise is an important component of a healthy life for all animals. It helps with balance, mobility, mental agility, and yes, maintaining a healthy weight. Yes, your senior cat may have less interest in exercise, just like many of us as we get older, but it’s important for you to coax your kitty into daily movement. That way, your cat has the best chance of staying healthy and feeling good for years to come. Hopefully, this short list of cat exercises gives you fodder for your kitty “gym.” If you have questions about your cat’s optimum diet and exercise, please discuss with your veterinarian as they can share more customized solutions.